As summer comes to a close, we want to take a moment to reflect on a fabulous season of fun events! From weddings to corporate meetings and other fun occasions, we had the pleasure of hosting 32 events this summer. 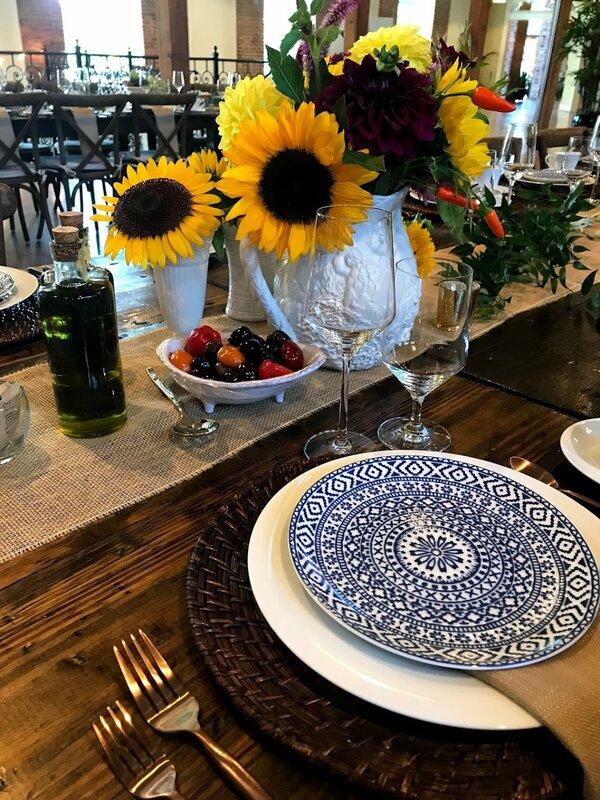 We love seeing how each and every event gives our space a unique feel. From decor to setup, there’s no end to the creativity. 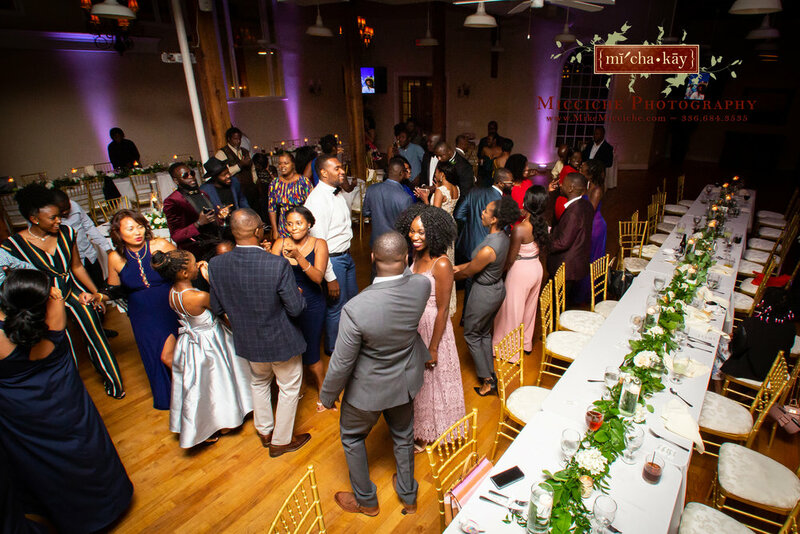 If you’re looking for inspiration for your next Greensboro event, go no further than this recap of some of our biggest summer events! 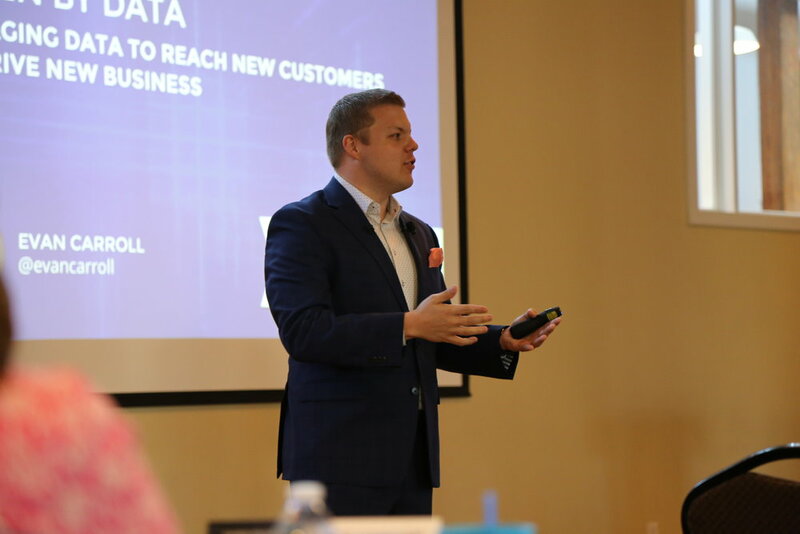 120 attendees received a company update from Spectrum Reach and training on how to effectively use data to reach new customers. We served a hot breakfast of eggs, bacon, home fries, our delicious biscuits + gravy, and fruit. Photos Courtesy of Spectrum Reach. More than 260 people gathered at The Colonnade on June 28th for Triad Business Journal's Best Places to Work awards! With a fun Hawaiian theme, guests enjoyed tropical treats and pulled pork sliders. One of the most popular dishes was dubbed "Floribbean Surf & Turf." It's a fun mix of margarita grilled chicken in tequila cream sauce over lobster and shrimp infused rice! Photos Courtesy of Triad Business Journal. 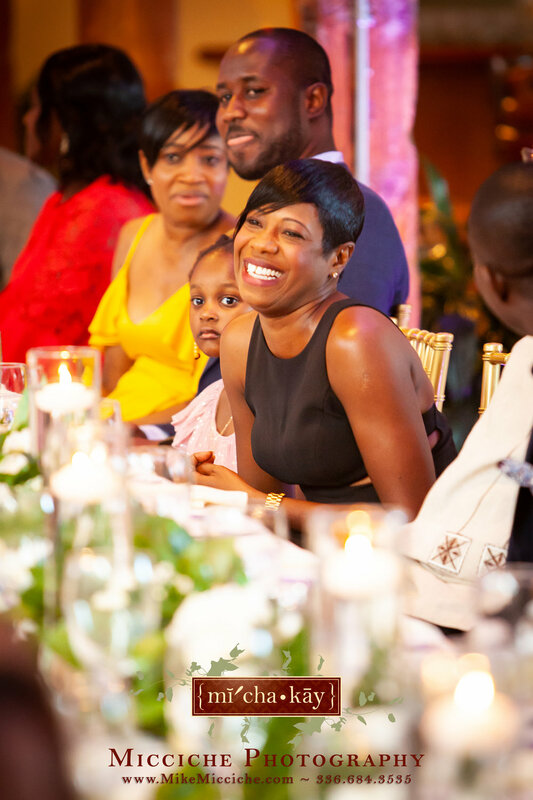 On June 29 Lauren and Will celebrated their upcoming nuptials with family and friends. They kicked the event off with a cocktail hour in the courtyard followed by a plated dinner. AM Rodeo entertained guests and everyone enjoyed a UNC themed cake from Sweet Meg’s. The couple dressed up The Colonnade with linens and floral arrangements (by Kari Sells) in a neutral color scheme of gray and soft green. Photos Courtesy of Aura Marzouk. Carlie and Luke opted for a downstairs ceremony, followed by a dinner buffet. 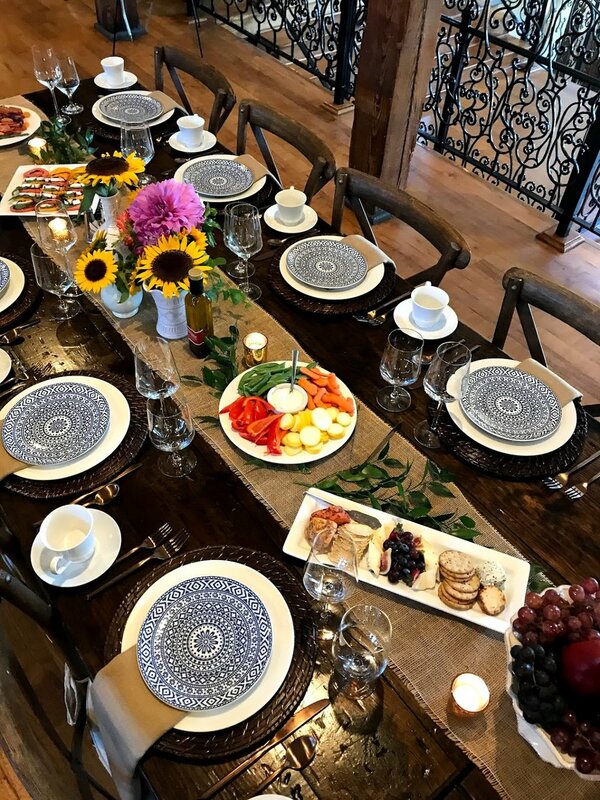 The buffet featured several gluten-free options, including a tossed garden salad, Jack Daniels pork loin, grilled vegetables, and roasted baby potatoes. A dusty blue color scheme fit right in with the beautiful clear day they had! Photos Courtesy of Jennifer Strange Photography. Since 1995, Leadership North Carolina has provided cutting-edge programming to current and emerging leaders from across the state. Every summer LNC selects a class of engaged citizens to learn about issues related to government, economic development, health and human services, education, and the environment. In July, Leadership NC alumni took a four day tour across the state. They stopped at Revolution Mill for a lunch presentation and a tour of the campus. Photos Courtesy of Leadership North Carolina. Did you know The Colonnade is available for rent by the hour for photo sessions? You can rent our space for engagement shoots, bridal portraits, or senior portraits! Prices start at $50/hour. 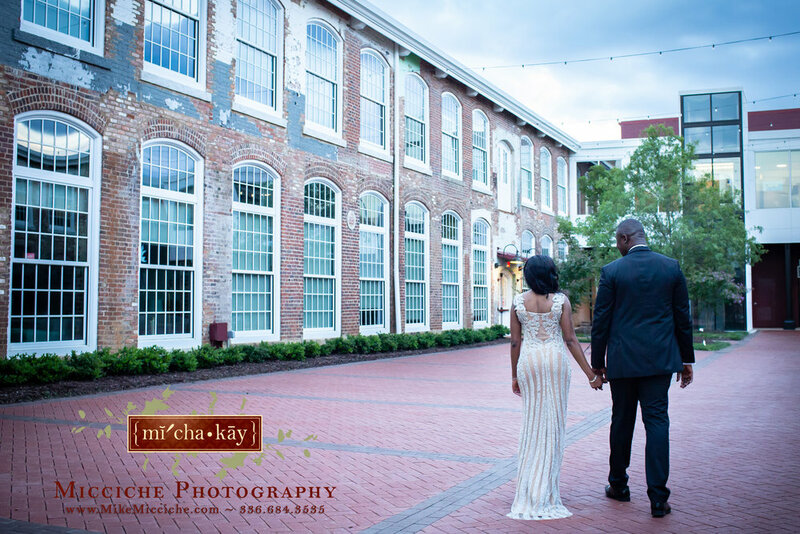 "Jaime and her staff at Revolution Mill were absolutely fantastic! My husband and I got engaged in January 2017 and booked our venue in February 2017. We were recently married on July 28, 2018. Throughout our one-and-a-half-year engagement, Jaime kept in touch with us, often checking in, and helped us plan our special day. 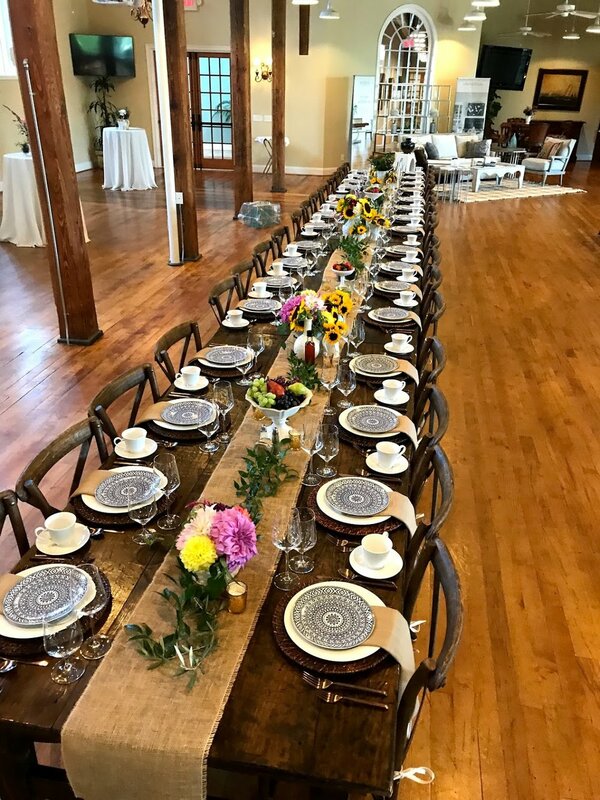 She was friendly, hospitable, and kind from the moment we inquired about getting married at the Colonnade at Revolution Mill. As our engagement progressed, Jaime reminded us of items that needed to be complete, sent us our updated contract(s) as we made changes, and really focused on what was important to us on our wedding day. 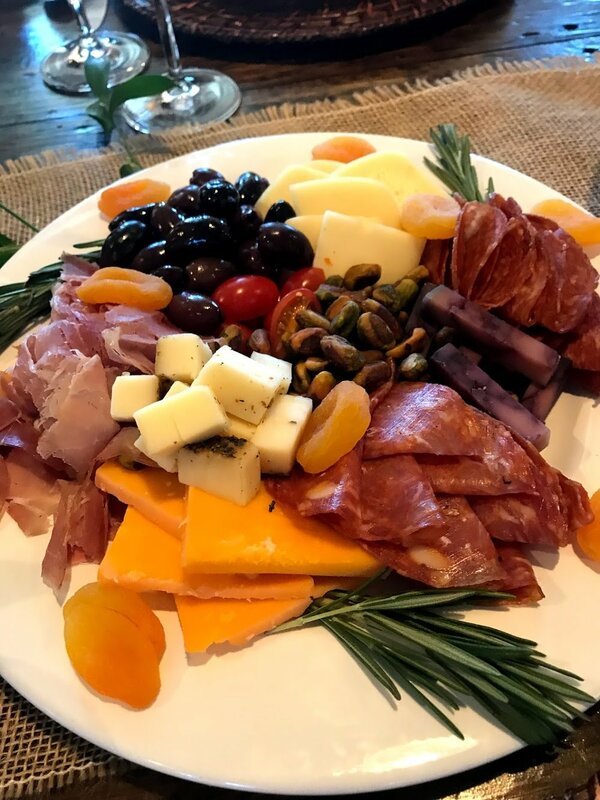 She provided us with multiple opportunities to attend tastings and allowed us to walk through the venue closer to our big day to get a feel of how things would work. Jaime answered all of my emails immediately and was so easy to correspond with...Any time that Jaime saw an opportunity to help us save money, she shared it with us so that we could decide whether to pursue the suggestion. Our food was out of this world! We received so many compliments from our guests about our menu options. The staff was accommodating and made my husband and I feel like royalty on our wedding day. It truly doesn’t get any better than Revolution Mill. 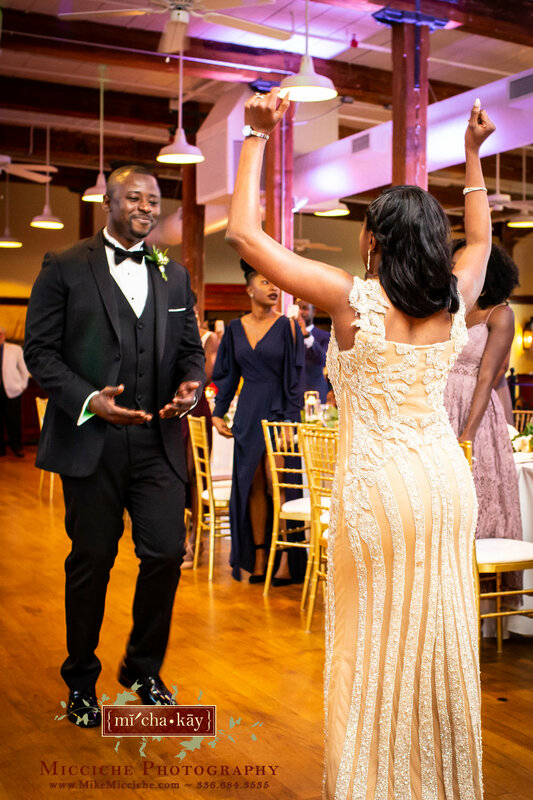 From start to finish, Jaime made the wedding planning process easy (and stress free)... Our ceremony set-up was everything we hoped it would be and I hope these photos provide a little glimpse of what an indoor ceremony at Revolution Mill is like." Vendors: A Touch of Southern, Sedgefield Florist, Bake Me Happy, Rhino Weddings & Events, Minerva String Quartet, Point 200. Photos Courtesy of Jodi Gray Photography. Veronica and Maisson had a beautiful indoor ceremony. They were joined by their dog as they exchanged their vows. A beautiful double rainbow was spotted in the courtyard just before the ceremony (timing?!). After the event, the couple left us a note saying: "Thank you so much Jaime, it was everything we wanted and more." Vendors: Jeffrey Surles, Delicious, Corda Entertainment, K2 Productions. Photos Courtesy of Jamie Blow Photography. Adil and Nana hosted their reception at The Colonnade on August 4, 2018! 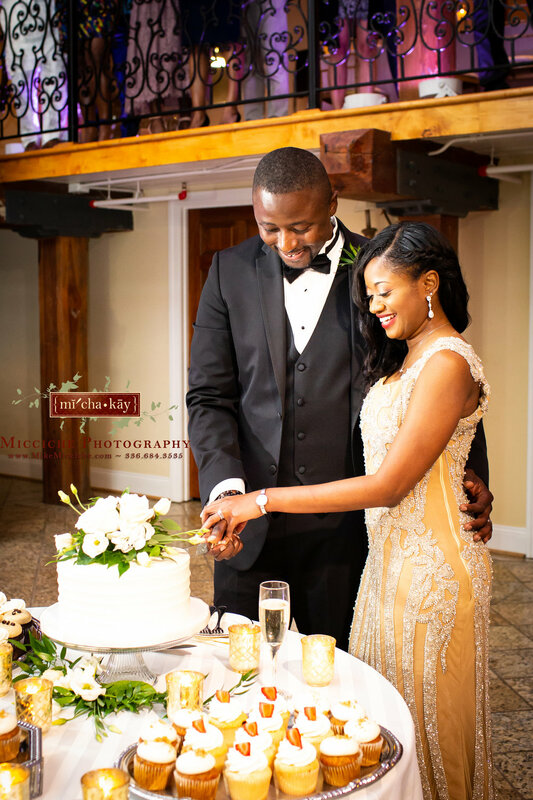 The couple had family attend from all over the U.S. and from as far as Ghana, their home country, to celebrate the special day. Vendors: Maxie B’s, Botanica, Friendly Neighborhood DJ. 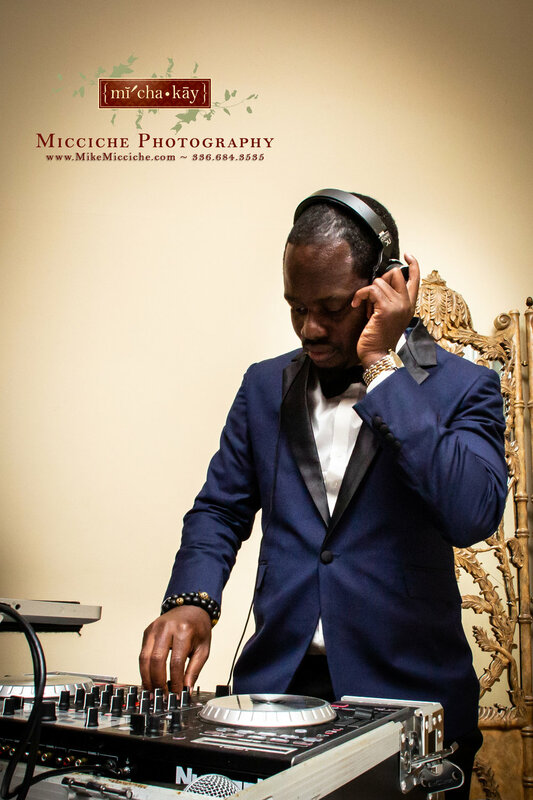 Photos Courtesy of Micciche Photography. Late afternoon in the courtyard is a magical spot for a romantic photo session. 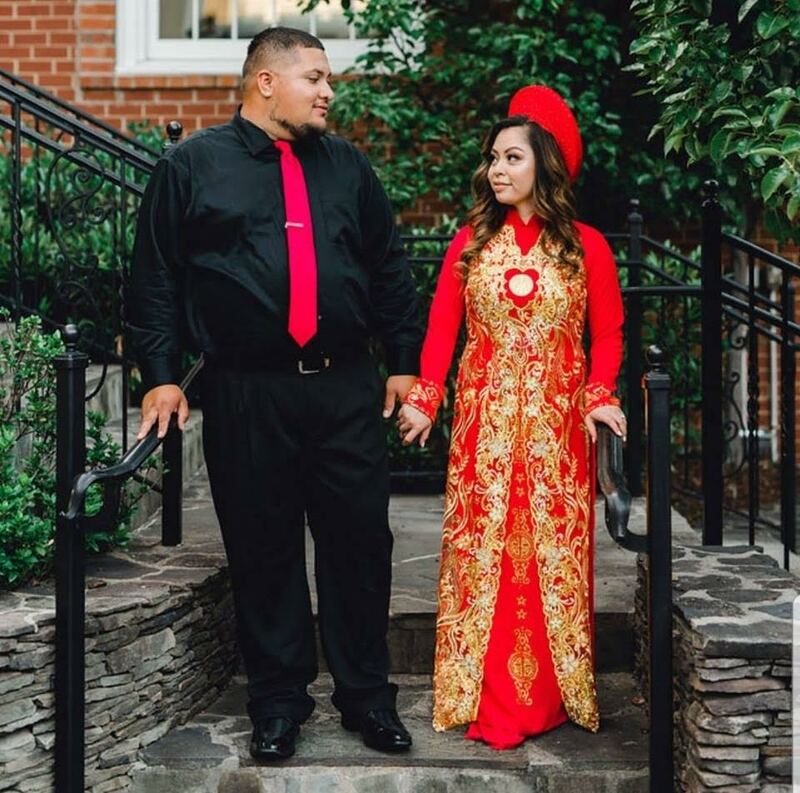 Victor and Melody also celebrated her Vietnamese heritage by taking some traditional wear shots. Photos Courtesy of Liz Grogan Photography. This creative forum featured the Triad’s enduring legacy as a center for textile, furniture-making, and manufacturing. 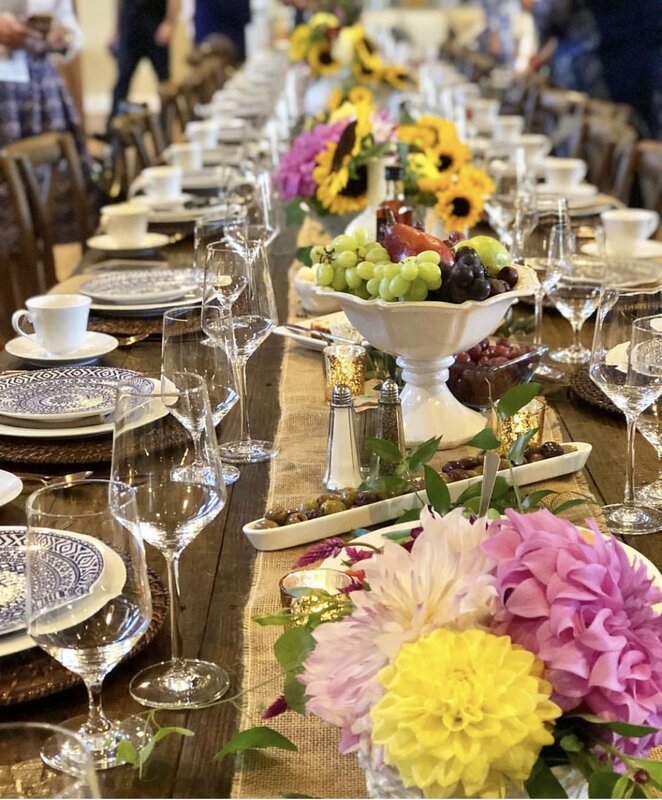 Designed to inspire, educate and entertain, the three day long event delivered five custom-designed educational experiences, as well as excursions to savor the best food and culture North Carolina has to offer. 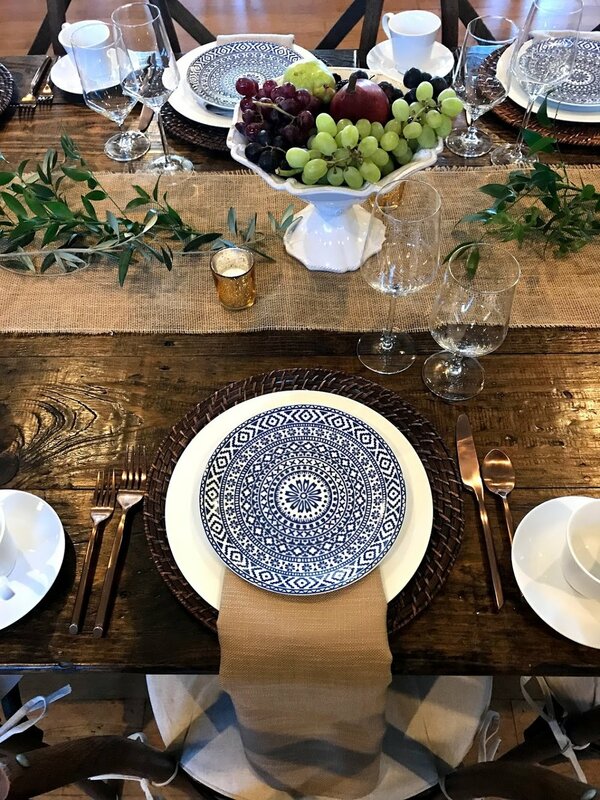 We were delighted to be a featured stop for the Designer Experience! Guests arrived to The Colonnade at 5p to enjoy a cocktail hour featuring local wine and beer before sitting down to a three-course family style meal. 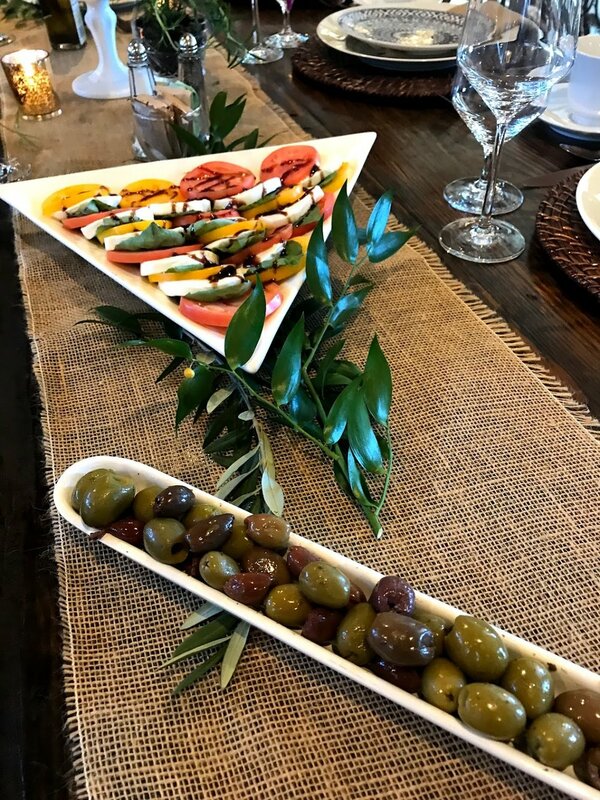 Charcuterie boards, cheese platters, and caprese salad were followed by grilled salmon, oven roasted vegetables, and pasta alcantara. For dessert, a selection of petite fancy pastries was served.